Tekken 1-6 Characters NEW Roster. 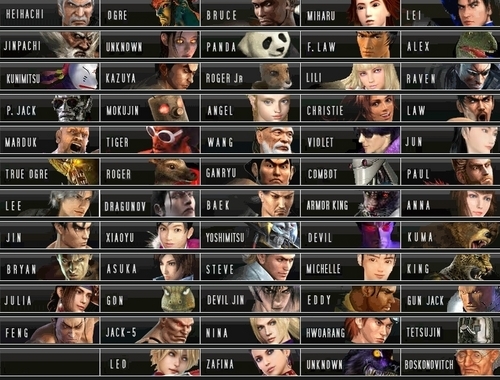 Tekken Characters. HD Wallpaper and background images in the Tekken club tagged: tekken king iron fist roster 6 New jin jun characters. O_O Unknown is twice there! OMG! And where's Jack, Jack-2, and Jack-6? And since this is meant to be up to 6 as it says so in the title, where is Bob, Alisa and Lars? Also if you're treating M. Law and F. Law as different people, what about King I & II, Armour King I & II and Kuma I & II? Wow my sister Michelle is in there too! Oh yeah and me too! For Gun Fury 81: maybe you do missing icons!